TAIZHOU, China—The U.S. auto industry has long had three big domestic car makers. China has more than 170, including tiny Zhejiang Jonway Automobile Co.
Jonway makes a sport-utility vehicle named after the Airbus A380 jumbo jet. Its A380 SUV starts at 70,000 yuan ($11,272) and is marketed as a smooth, low-maintenance ride. Customers aren't buying it. Last year Jonway sold about 5,000 cars compared with the more than 7,000 that Volkswagen AG sells on average in China every day. Little Jonway isn't fazed by the market reception. It plans to release a new SUV model this year, beef up marketing and is considering exporting vehicles to South America. It continues to work on its technology with the help of supportive local officials, and it just received a license from the Chinese government to begin making electric cars. "China is the largest car market in the world, and it still has potential to grow. Our ambitions are congruent with reality," insists Alex Wang, Jonway's 31-year-old, U.K.-educated chairman. Optimistic Chinese auto executives like Mr. Wang send shudders through the rest of the global auto sector. Industry watchers worry that the world's No. 1 auto market could soon be awash in overcapacity. That would rev up competition in China and pressure companies here to export more of their cars. "We may see high levels of overcapacity and significant margin pressure within the next three to five years," said Bill Russo, president of auto consulting firm Synergistics Ltd. and a former Chrysler executive. He estimates that China's overcapacity in three years could total 10 million cars, roughly equivalent to Japan's 2012 auto production. Overcapacity worries aren't confined to cars. China has a glut of factories in industries ranging from steel to construction equipment to solar panels. Beijing encouraged heavy investment in those industries to move away from its dependence on low-level manufacturing. While central government officials signal that they want to tamp down on capacity, local governments are still backing local champions that are major employers. China's car-making capacity is set to soar in coming years. General Motors Co., Volkswagen and Ford Motor Co . are building new factories and assembly lines. China's top 10 auto groups—which make both foreign and domestic brands—are expected to have combined capacity to build about 35 million vehicles a year by the end of 2015, according to their previous announcements, compared with 18 million vehicles in 2012. But sales growth is slowing. McKinsey & Co. forecasts that China's auto market will grow by an average 8% a year through 2020, down from a compound average rate of 24% between 2005 and 2011. Experts expect domestic brands will incur the brunt of the slower gains because foreign brands such as GM and VW enjoy a reputation for quality among Chinese drivers. 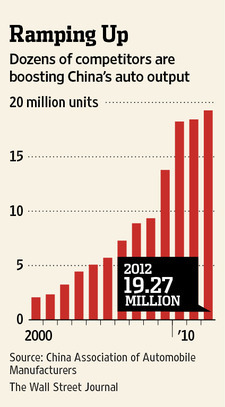 Foreign brands currently make up roughly two-thirds of China passenger car sales. Last year, Dong Yang, vice chairman of the semiofficial China Association of Automobile Manufacturers predicted about half of domestic brands may disappear in coming years. But many Chinese companies enjoy subsidies designed to bolster local champions. For example, the western city of Chongqing said last June it would give a subsidy of up to 3,000 yuan for buyers of some models of vans made by local car maker Chongqing Changan Automobile Co., while FAW Car Co. said in August that the northeastern city of Changchun would offer a subsidy of between 3,500 yuan and 7,000 yuan for buyers of some cars made by the company. The U.S. last year filed a case before the World Trade Organization arguing that China unfairly supports auto companies and parts makers, an accusation Beijing disputes. Many are also looking abroad. Last year Chinese auto exports rose 19% to one million vehicles, mainly to markets in the Middle East, Russia, and South America, according to the trade association. Chinese officials have acknowledged the problem. In July, the Ministry of Industry and Information Technology said China has more than 171 car, truck and bus manufacturers, and said passenger vehicle producers that make fewer than 1,000 vehicles for two years in a row will be ordered to overhaul production. China has auto makers even smaller than Jonway. 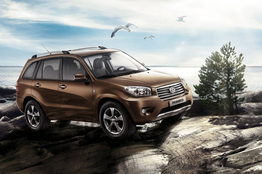 According to research firm IHS, a company called Tianqi Meiya sold 77 passenger cars last year. The company, in the north Chinese city of Tianjin, didn't respond to requests for comment. Jonway builds its vehicles in Taizhou, an eastern city where local officials are pushing to create their China's version of Detroit. According to a plan the city issued in 2010, officials committed to giving local auto makers land and helping them recruit talent, and it allowed banks to roll over loans to cash-strapped companies. Other auto companies doing business in the region include Zhejiang Geely Holding Group Co., the Chinese auto maker which acquired Volvo Car Corp. from Ford Motor Co. in 2010. Jonway's U.S. parent, a Santa Rosa, Calif., electric vehicle company called Zap, said in its most recent annual securities filing that the Chinese auto company received $1.6 million in subsidies and incentives in 2010 and 2011 combined. Jonway reported a 2011 loss of $10.2 million on sales of $54.3 million. Mr. Wang's father and Jonway's founder, Wang Huaiyi, is a major Zap shareholder and a member of the board. The Wang family started its China-based business in the early 1980s, producing everything from buttons for clothes to parts of electric fans. In the 1990s it began supplying parts for motorcycles made by Geely before the latter began making cars. Inspired by the high-profile success of Geely Chairman Li Shufu, in 2003 the senior Mr. Wang invested 600 million yuan, or about $72 million, in an SUV manufacturing facility with an aim at targeting China's growing middle class. The younger Mr. Wang began managing Jonway in 2008 two years after returning from studying in the U.K. "I've never thought of the overcapacity problem," he said. Jonway "has done very well in the motorcycle business and it needs a bigger platform to grow. The car industry is just the platform through which we can grow stronger." Jonway used Toyota Motor Corp.'s RAV4 SUV as a reference when designing the five-door A380, he said. Its sales grew to nearly 8,000 in 2010 from 4,500 the year before. But sales began slumping in 2011 with China's decision to end buyers subsidies for cars with engine capacity of 1.6 liters or smaller. Mr. Wang said he believes the sales problem is marketing. "Building brand recognition needs time," he said. "Jonway is in urgent need of improved marketing." Jonway aims to sell 20,000 SUVs and minivans this year, and plans to add 50 dealers to its existing network of 100 dealers across the country. Other efforts include bigger dealer incentives, more advertising spending and a push to raise its profile at this month's auto show in Shanghai, he said. It is also eyeing exports, targeting volume of 3,000 vehicles in emerging markets such as South America and Africa, Mr. Wang said. Jonway parent Zap has a team of Spanish-speaking sales representatives, "which is a unique edge to us." A version of this article appeared April 10, 2013, on page B10 in the U.S. edition of The Wall Street Journal, with the headline: China Lets 170 Auto Makers Bloom.